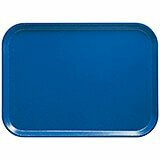 We have the biggest range of food and beverage trays for you needs. With our polycarbonate food trays, you get a smart option to serve food in correctional facilities, cells and other similar tough environments where you depend on a tray that is practically unbreakable. 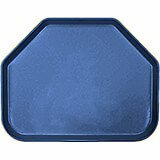 These food serving trays are made from rugged polycarbonate material that makes them capable of handling heavy-duty use even in extremely trying conditions over a long tenure. They are unbreakable and are available in rectangular and trapezoid shapes of different colors. Our food trays are equipped with Dri-Stak separators for facilitating air circulation ensuring drying at the faster speed. 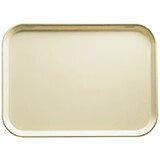 These polycarbonate food trays are easy to handle, thanks to the large stacking lugs that keep them separated. Rectangular Camwear Trays. Exclusive Dri-Stak separators allow air circulation for quick drying. Trapezoid Camwear Trays. Exclusive Dri-Stak separators allow air circulation for quick drying. Camwear Trays deliver years of reliable service even after constant rough handling because they are made from virtually unbreakable polycarbonate. Large stacking lugs keep trays separated for easy handling. Plus, our exclusive Dri-Stak separators allow air circulation for quick drying. An option for correctional facilities. Trapezoid Camwear Trays deliver years of reliable service even after constant rough handling because they are made from virtually unbreakable polycarbonate. Large stacking lugs keep trays separated for easy handling. Plus, our exclusive Dri-Stak separators allow air circulation for quick drying. An option for correctional facilities.